let's make something crazy beautiful. 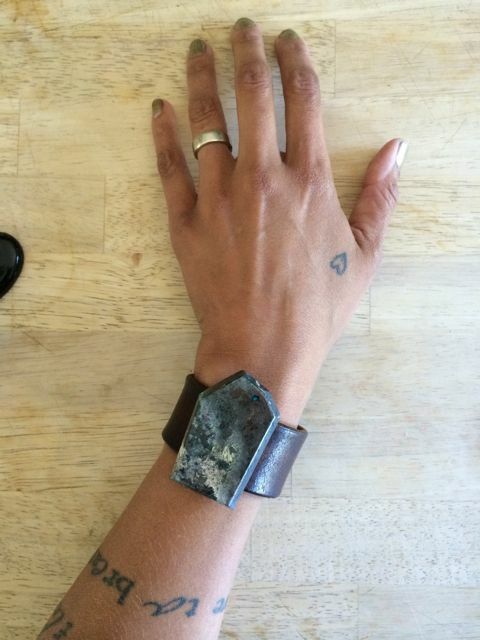 we've teamed up with a truly amazing and lovely rockhound/artist over here at lovinganvil. she's out there, moving around the western u.s. desert, scouting and digging in family claims. we're absolutely stunned and thrilled by the treasures she's finding/seeing/co-creating with mother nature. and we feel blessed by her good energy and excitement in working with us. each stone that we have from this collaboration comes with a story and full history of it's discovery and travels. fair trade and kindness through and through. art/adornment/jewelry created with these pieces are one of a kind and strong of love and metaphysic energy. there is no worry of mistreatment in their mining. well. except for the occasional scorpion sting. but our rockhound has what sounds to me to be a pretty solid plan for avoiding that in the future. ! each stone could lend itself well to a variety of placement on the body- wrist, hand or neck - equally. and as they are as unique as the person attracted to them, we would like to offer them with the opportunity for the patron to be actively involved in the creation of the adornment. in each listing that follows, necklace, ring, bracelet options are offered with a base price for a piece to be custom developed. Black Lace Agate Black agate is considered a receiving stones and is used for calming, soothing, inward meditation and reflection. When used for Chakra healing and balancing, Black Agate represents the element earth, and is therefore related to our survival instincts, and to our sense of grounding and connection to our bodies and the physical plane. Ideally, when using black stones at the Root Chakra, they bring us health, prosperity, security, and dynamic presence. Red Jasper is gently stimulating and also an extremely protective stone. It can neutralize radiation and other forms of environmental and electromagnetic pollution. Red Jasper rectifies unjust situations and grounds energy. Brings problems to light and provides insights into difficult situations. An excellent “worry bead”, Red Jasper calms the emotions. Aids in dream recall. Cleans and stabilizes the aura. A stone of health, Red Jasper strengthens and detoxifies the circulatory system, blood and liver. It helps bring problems to light before they are a threat. Also used for protection, courage, energy. Help with blood, relieve anemia, stop bleeding, heal rashes and wounds. oriented to self-preservation. Balances all chakras. several small pieces available, please ask. CHRYSOCOLLA is the stone of peace and is associated with unconditional love and compassion. Work the archetype of wholeness. It is associated with femininity, water and moon. It brings patience, kindness, tolerance, compassion and humility. Banish negative energies and predisposes to harmony and success. Good for Sagittarius, Aries and Leo. Fourth and seventh chakra. 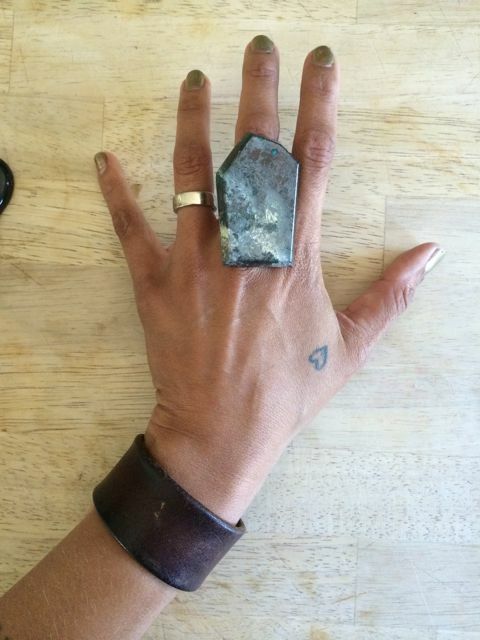 HEMATITE dissolves negativity in all forms, particularly useful during healing to ground high vibrational states. It assists mental functioning, memory and development and calms the mind instiling deep inner peace. Additionally boosts confidence and self worth. Specular Hematite brings grounding and high energy at the same time. It allows you to see the events of everyday life, and it aids you to attain the ability to comprehend multiple levels of reality. Helps with spiritual expression and manifesting what brings you joy. It allows you to reach for the stars, without being limited by what you think is possible or allowed. aka Purple Jasper, Royal Plume Jasper Stimulates the crown chakra. It eliminates contradictions Purple is also a color that will connect you with your spiritual self. It is good for mental and nervous problems. It will assist very well with rheumatism and epilepsy. Helps with pain, is used in deep tissue work and helps heal the bones. Too much purple and you don't tend to live in this world. JASPER protects from negative energies and bad intentions. In women helps to highlight your elegance and grace. It vibrates with sincerity and love clean and healthy. Defends us from infections and pollution that surrounds us. Protects the fears and apprehensions and provides balance. Picture Jasper encourages ecological awareness, bringing stability and balance. It is a stone of proportion and harmony and stimulates creative visualization. It helps to bring hidden thoughts and feelings to the surface to be released. Brings comfort and alleviates fear. Picture Jasper stimulates the immune system and helps treat disorders of the skin and kidneys. It holds an aspect of solar energy and a connection to the solar plexus. Picture Jasper is a stone of harmony and visualization. Spider Web Jasper - Soothes frayed nerves. Valium-like in its effect. Even by its name, Spider Web Jasper speaks to the interconnectedness of universal energies and processes. It supports attunement to awareness of how these energies and processes work, change and integrate the web of life. see Jasper aka Purple Jasper, Royal Plume Jasper Stimulates the crown chakra. It eliminates contradictions Purple is also a color that will connect you with your spiritual self. It is good for mental and nervous problems. It will assist very well with rheumatism and epilepsy. Helps with pain, is used in deep tissue work and helps heal the bones. Too much purple and you don't tend to live in this world. JASPER protects from negative energies and bad intentions. In women helps to highlight your elegance and grace. It vibrates with sincerity and love clean and healthy. Defends us from infections and pollution that surrounds us. Protects the fears and apprehensions and provides balance. aka Purple Jasper, Royal Plume Jasper Stimulates the crown chakra. It eliminates contradictions Purple is also a color that will connect you with your spiritual self. It is good for mental and nervous problems. It will assist very well with rheumatism and epilepsy. Helps with pain, is used in deep tissue work and helps heal the bones. Too much purple and you don't tend to live in this world. JASPER protects from negative energies and bad intentions. In women helps to highlight your elegance and grace. It vibrates with sincerity and love clean and healthy. Defends us from infections and pollution that surrounds us. Protects the fears and apprehensions and provides balance. Protection stone, connects to solar plexus to form shield; also protection stone for travel. Balances the yin-yang energies. Stabilized the aura and eliminates negativity. Bring what one needs. Note that it doesn't necessarily bring in what you want. However, it is a wonderfully supporting stone. Leopard Skin Jasper helps you to connect with your spiritual animal totem. It is associated with spiritual discovery and shaman travel. It assists in self-healing. Also helpful in eliminating toxins from the body. chinese writing stone assists one in directing the dream state toward a pre-determined subject; a good stone for assisting one in adapting to changes in their lives. It is a stone of re-affirmation and helps one to accept and adjust to change, accept responsibilities and stimulate thinking and creativity. This is a very intuitive stone. It is an excellent stone for dreaming, promotes peaceful dreams and assists one into a dream state. Chinese Letter stone can help one form clear thoughts and reach goals. It assists in relationships and strengthens your commitment to them. It provides strength for emotional issues. It is associated with the root chakra and issues involving feeling grounded and the third eye chakra due to its association with dreams and dreaming. serape jasper This stone is a methodical and meticulous worker of practical, down to earth solutions. It has the ability to foster and nurture and its energy is used for grounding and protection. Considered more effective if it is used for long periods of time because it works slowly. This mineral is a super nurturer. Jasper with yellow color is used to assist and protect during times of spiritual and physical travel. Jasper with red color is used for health and re-birth. Jasper with blue color is used to connect with the after worlds. Jasper is a stone of protection. It protects against negativity and aids in the grounding to the stabilizing energies of the earth. It can be used to align the energy of the chakras and balances the Yin-Yang energies — also balances the physical, intellectual and emotional bodies. Jasper stabilizes the aura, providing a cleansing effect to smooth dysfunctional energies and eliminating negative energies. JASPER protects from negative energies and bad intentions. In women helps to highlight your elegance and grace. It vibrates with sincerity and love clean and healthy. Defends us from infections and pollution that surrounds us. Protects the fears and apprehensions and provides balance. Especially good for Libra, Gemini and Aquarius. First and third chakra. This stone is a methodical and meticulous worker of practical, down to earth solutions. It has the ability to foster and nurture and its energy is used for grounding and protection. Considered more effective if it is used for long periods of time because it works slowly. This mineral is a super nurturer. Jasper with yellow color is used to assist and protect during times of spiritual and physical travel. Jasper with red color is used for health and re-birth. Jasper with blue color is used to connect with the after worlds. Jasper is a stone of protection. It protects against negativity and aids in the grounding to the stabilizing energies of the earth. It can be used to align the energy of the chakras and balances the Yin-Yang energies — also balances the physical, intellectual and emotional bodies. Jasper stabilizes the aura, providing a cleansing effect to smooth dysfunctional energies and eliminating negative energies. JASPER protects from negative energies and bad intentions. In women helps to highlight your elegance and grace. It vibrates with sincerity and love clean and healthy. Defends us from infections and pollution that surrounds us. Protects the fears and apprehensions and provides balance. Especially good for Libra, Gemini and Aquarius. First and third chakra. AZURITE is known as the stone of wisdom and of evolution, because it helps us understand and integrate those difficult moments of our lives. Gives us the tenderness, compassion and protection that only a mother can bestow. It also helps to overcome the uncertainty and anxiety generated by ignorance and improvidence. It is ideal for moments of crisis, as well as family health and labor. It helps us to meditate, to make insights that will enable us to resolve our conflicts. Sixth and seventh chakra. Good for Sagittarius, Aries and Leo. Arizona Lizard Stone Jasper This stone occurs in colors ranging from light to dark green. It promotes healing on all levels, allowing the body to reject the cause of the disease. Disorders of the skin and bloating are assisted by Arizona Lizard Stone. It alleviates headaches and provides emotional stability. Energy blockages which may lead to poor circulation can be removed through the use of this stone. Jasper with yellow color is used to assist and protect during times of spiritual and physical travel. JASPER protects from negative energies and bad intentions. In women helps to highlight your elegance and grace. It vibrates with sincerity and love clean and healthy. Defends us from infections and pollution that surrounds us. Protects the fears and apprehensions and provides balance. 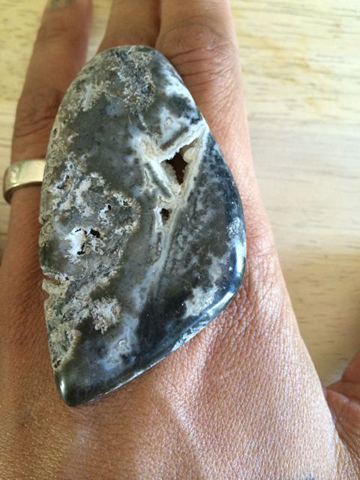 ZEBRA JASPER helps with depression and anxiety, and that gives us energy balance. Also support to connect with Mother Earth and the infinite energy and love in the Universe. Provides protection to the aura and helps to show us our own inner nature, which makes us more aware of our true desires and allows us to pass to action. Physically stimulates energy, resulting beneficial for endurance and bone disorders. It also helps in muscle spasms and heart palpitations. Fossil Coral combines the therapeutic properties of agate and coral. It helps in self-expression, as it increases the ability to communicate. It also serves as a protector against bad energy. Physically aids in breathing difficulties and problems of the pancreas and improve blood circulation. Coral is also associated with the female reproductive system and has been used in ancient healing traditions for women's health problems. Eases fear as well as emotional and social strain. It combats foolishness, nervousness, fear, depression, panic and nightmares. Coral is used to attract success. It also strengthens the ability of foresight. It is believed that Corals can counter evil spells.